In Colour by Fingal Arts. In Colour is an exhibition featuring work by some of Ireland’s most prolific 19th and 20th century artists, studied on the leaving certificate art history syllabus. Fingal is defined by its rural, urban and suburban landscape, culturally diverse communities and a significant youth population, of which 30% is younger than 18 years of age. 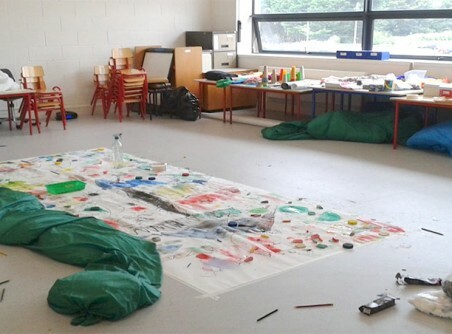 Fingal County Council Arts Office has made cultural provision in their annual arts budget for children and young people since its inception in 1994. The dedicated Youth & Education Officer post was established in 2005 and the first Youth & Education Policy passed by council in 2010. Our purpose is to bring the arts to life in Fingal and Fingal to life through the arts. Our vision is of a county where the arts are valued in people’s everyday lives. Our Mission is to invest in and champion the arts in Fingal. We have determined four areas of work that we will focus on in the lifetime of our new County Arts Plan 2018 - 2025. By concentrating on these areas we will be true to our purpose and realise our mission and vision, so advancing Fingal as an exceptional county to live in, work or visit. Through investment in infrastructure and in the creation of opportunity we will have ensured a place for the arts in peoples’ lives. People are confidently and imaginatively coming together through the arts. Fingal is known for its great artists and art. Fingal County Council and its Arts Office have the knowledge, skills and resources to deliver this plan.